Why the 2008 Mercury Milan? The I4 Milan absorbs both small and large bumps without disturbing the ride or ever feeling too soft or too hard. You can hear the bumps but the sharp edges are not transmitted through to the seat or steering. Very good on center sense of direction. 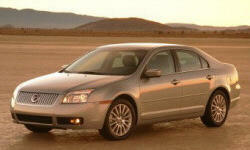 Ford Fusion and Mercury Milan have scored well in recent quality and reliability surveys. This is supported by our own experience with two recent FoMoCo cars, both very reliable with a combined 160,000 miles. Have another car with the same reliable 2.3l. The Premier features an audiophile 6-disc CD changer with Sirius satellite radio and Microsoft Sync iPod and Bluetooth phone integration, controlled by steering wheel mounted buttons and voice commands. Sync really is easy and effective. Hands free cell. Why Not the 2008 Mercury Milan? Compared to the latest competition the Milan is not as quiet as the Sonata or Malibu. The 2.3l has a sporty growl under acceleration but is quieter at cruise. Wind noise well controlled. Road rumble is noticeable. Others offer better noise isolation. The 2.3 liter works all 160 horsepower for freeway merging. The new 2.5 liter or a future EcoBoost turbo charged engine could cure this while preserving fuel economy. Both Sonata and Malibu have smoother, quieter, more powerful powertrains and better mpg. Hyundi Sonata with similar size engine and a 5-speed automatic delivers 22/32. Malibu with a 2.4 and a 6-speed delivers 22/32. Focus/Milan with a 2.3 and 5-speed auto 20/28. Initial freeway driving is consistent in the 28-30 mpg range. Competitors better. 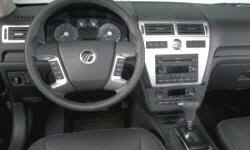 The dash and interior are comfortable and function well, but are a bit sharp edged. I would prefer a more curvalinear, organic shapes. For instance, the arm rest and door pull are a straight shelf. Prefer those that offer a vertical handle like 02 Cougar.